Servo motor sizing is an energy balancing act. Done properly, it reduces energy costs, purchasing costs, and operating costs. Plus, it enables the design of better motion control systems. 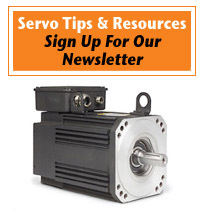 Servo motor sizing also provides considerable cost savings while assuring the best system performance, and can dramatically reduce downtime and the need for servo motor repair. The U. S. Department of Energy estimates that approximately eighty percent of servo motors in the U. S. are oversized. This is usually due to uncertain load requirements; allowance for load increase (due to aging mechanical components); and availability. It is not easy to select the optimum servo motor size for a given application when standard praxis demands the addition of safety factor to torque requirements. This safety factor is to cover for additional friction forces that may occur during the aging of mechanical components. Add to that the time consuming determination of system load and the selection of the correct servo motor size. Since Torque = Inertia x Acceleration, each motor has its own rotor inertia that contributes to system load torque. Therefore, system torque must be calculated for each servo motor size under consideration for an application. Mechanical components such as ball bearings or couplings encounter wear, depending on the environment and service quality, that may produce higher friction forces. These friction forces contribute to constant torque. In such a case, a servo motor sized 20% larger than necessary is acceptable. In the event of future expansion, a servo motor oversized by 20% would provide the additional capacity necessary and may even eliminate the need to replace the existing servo motor. Higher loads can likely be sustained in circumstances wherein the higher load was not anticipated. Oversized servo motors are likely to start as well as operate in undervoltage conditions. Bottom Line: For optimum performance at the lowest possible cost it is essential to choose the smallest servo motor that matches the required torque as closely as possible. Smaller torque will result in lower costs and lower power consumption. For help with servo motor sizing or other repair services for servo motors, TigerTek helps clients around the US with our industry-leading quality, experience, turnaround time & customer service, all at highly competitive prices. Contact us to ensure you get the proper servo motor size for your system and unparalleled workmanship.